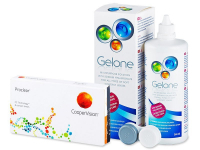 This package contains a 360ml bottle of Gelone solution and Proclear Sphere contact lenses. Proclear lenses provide high water content and oxygen permeability for maximum comfort throughout the day. Proclear Sphere are high-quality contact lenses produced by CooperVision. Proclear Sphere lenses have an exceptionally high water content (62%), making them ideal for users who suffer from dry eye syndrome; wear contact lenses at least 12 hours per day; or work in air-conditioned or dry, dusty environments.